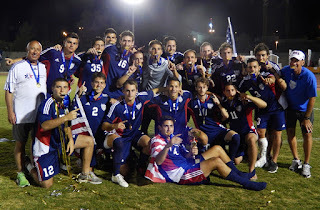 The 2013 team celebrates the first-ever gold medal for the U.S. in soccer at the World Maccabiah Games in Israel. 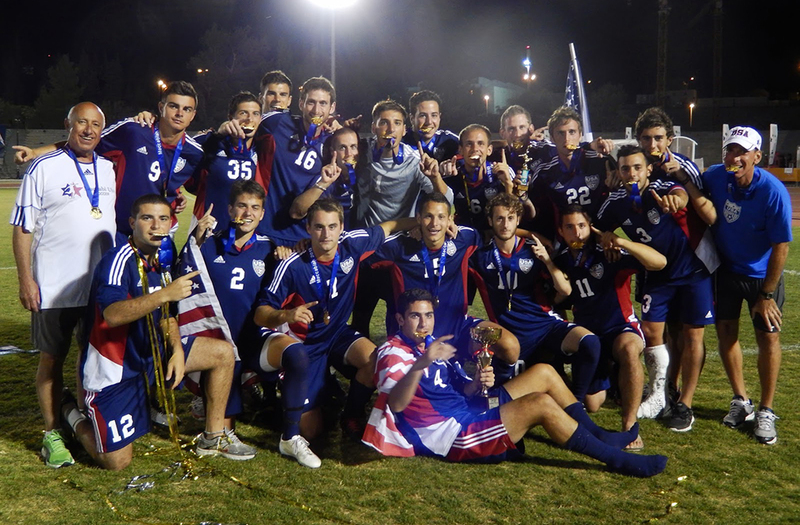 In the sports world, there is nothing like going out on top, and after leading the U.S. men’s open soccer team to its first-ever gold medal at the World Maccabiah Games in 2013, that’s what Coach Preston Goldfarb intended to do. “It’s hard to go back when you’ve reached the mountaintop,” he said. Instead, the recently-retired legendary head coach of Birmingham-Southern College is now preparing for another trip to Israel as head coach, with a repeat in mind. Goldfarb was head coach for the open men’s soccer team at the Maccabi Australia International Games in 2010 and for the junior boys’ soccer team at the 2009 Maccabiah. The 2009 team lost the bronze medal game to Brazil, 1-0, but was the only U.S. soccer team to play for a medal. After the fourth-place finish in 2009, the 2010 team took silver in Australia. In 2016, Goldfarb was named chair of U.S. soccer for the Maccabi Pan Am Games in Chile, and co-chair for the 2017 World Games. His assistant coach from 2013 was slated to be head coach this year, but was unable to continue due to health issues. Goldfarb agreed to come back as head coach last July after his friend convinced him that he’d be unable to continue in that role. Goldfarb said it turned out to be a positive development for him. Having just finished his Birmingham-Southern career, this gave him something to ease his transition into retirement. Repeating the 2013 feat will be “more difficult” this year, partly because there is a “bad schedule” for every team, and the U.S. is in a challenging preliminary group with Great Britain, Venezuela and Australia. The first match in pool play will be on July 5. Opening ceremonies are on July 6, then the next match is on July 9, followed by a third match on July 10. For those who advance from pool play, the quarterfinal matches are on July 11 — three matches in three days in Israel’s heat. “Last time, we played every other day,” he observed. Making it more difficult, the tournament has limited substitutions and no re-entry into matches. Goldfarb proposed greater substitutions, if for no other reason than each player has to raise or pay $8,000 to go to the games, and the current structure ensures at least four players will not play in a particular match. “To have four kids sit out each game is wrong,” he said. The team heads to Israel on June 25 for a couple of training days, then will tour the country. There are five starters from 2013 on the team. The team includes Sam Raben, who plays for Wake Forest. His father, David, is an oncologist at the University of Colorado whose first faculty position was at the University of Alabama at Birmingham in the 1990s. He will be blogging about the Games here.